In a previous post, Sharon commented, and graciously forwarded a link to online plumbing catalogs. Well, I have been astounded looking through these treasures! Thank you, Sharon!!!!!!! Then I realized that if I was having so much fun, so might you! So I decided to kinda transfer Sharon’s comment into this post. Ross, there are tons of period plumbing catalogs available at archive.org. I would encourage you to download some of them. You can just do an advanced search, put in your date range, and type plumbing in the box. Sharon included four links. These catalogs are period-specific to the 1894 Cross House. For your house, just put in your date range in the search box, as Sharon suggested. Love when your readers share their expertise. 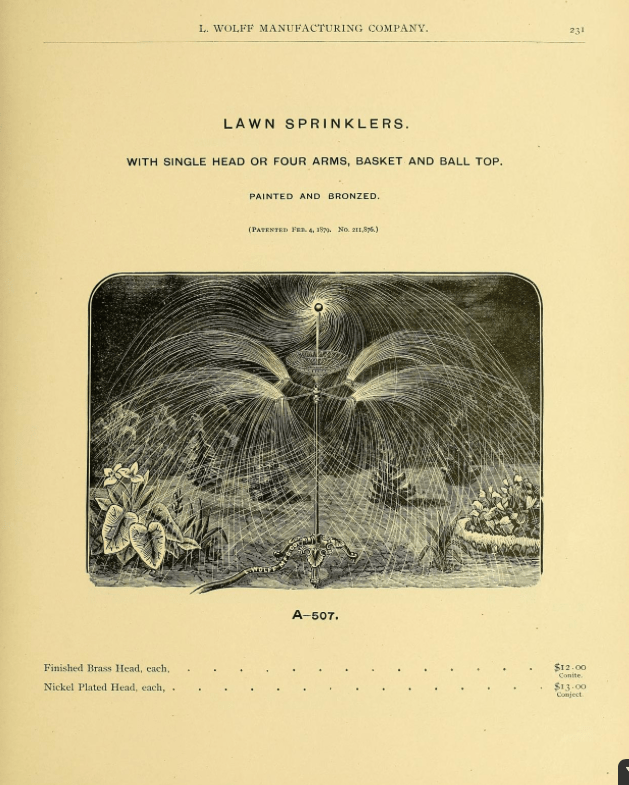 Love this sprinkler–efficient and beautiful. Do you suppose this could even be used if you located one? And you couldn’t leave it outside. You’d have clean it thoroughly every time you used it. Hmm. Guess I’ll stick with the ugly drip hoses. Oh I LOVE!! this sprinkler, too! Me want one too! And wouldn’t it be the best kind to run through on a hot day, too? And thank you to Sharon and Ross for sharing the source of some antique plumbing catalogs – I will be in heaven looking at every single item. I love those old catalogs too. I was able to find one that had our exact entry door, and I used the scaled profile drawings from an old millwork catalog to design the door and window cornice moulding I made for our house. The value of this old information is so much better than anecdotal and second-hand info elsewhere.